Besides a major redesign and important new features, Android 5.0 Lollipop also includes smaller changes and novelties that you may have not noticed. One of them is the ability to change the entire UI’s color scheme - albeit for now this is a somewhat limited feature. 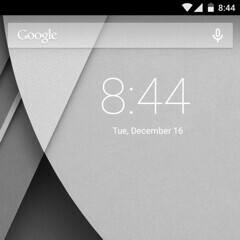 First of all, did you know that you can make Lollipop show everything on the screen in grayscale? To enable this, go to Settings -> Developer options (make sure they’re enabled) -> Simulate color space. Once there, you have several choices to play around with, including Monochromacy, Deuteranomaly (red-green), Protanomaly (red-green), and Tritanomaly (blue-yellow). Monochromacy is the only one that can be used for a longer period of time by regular users, as the other ones are uneasy to the eye. It's actually quite cool to have your smartphone or tablet display everything in black & white - it gives it a vintage feel. Another thing that you can do is to invert colors - which, once again, isn’t something that’s too pleasing to the normal eye. To enable this, go to Settings -> Accessibility -> Color inversion. After you first enable the option, you’ll be able to turn it off and on from the quick settings menu, as a button is automatically added next to those that provide access to Wi-Fi, Bluetooth, cellular connectivity, and so on. The Accessibility menu also contains a Color correction section with options similar to those found in the "Simulate color space" tab. Interestingly, if you take screenshots while in grayscale, inverted, or any other special mode, they will appear normal - as if you hadn’t changed anything. The black & white screenshots seen below have been edited for illustrative purposes. While these options are just interesting (and nothing more) for most of us, they might be very helpful for users who are colorblind, or have other color-related issues. Tap on the Settings icon to access the Developers options menu - notice that the Invert colors button is already enabled. There are tons of developer options, so you have to scroll down a lot before reaching the Simulate color space tab. Your shiny an colorful homescreen can get a new grayscale look with just a few taps. You can experiment and see how each of these options affect your display. To enable Color inversion, look for the Accessibility menu. Experimental? Well, let's experiment, then! Does monochrome mode save any battery ? I doesn't make much of a difference really, even on an amoled display like on Samsung phones, there's little difference. Does the monochrome mode save battery in nexus 5? Hmm am i the only one experiencing too many pop-up messages and being directed to playstore? Wow, so Lollipop CAN have a black background for the settings menu, who knew? Now if that was only a default option for those of us who don't want to light up a dark room when using our phones it would be great. The "Simulate Color Space" is something that is new, but not the "Color Inversion". I can do that on my Note 3 by doing the same process, but on the Note 3 its called "Negative Colors". PARSER ERROR:String could not be parsed as XML Nice, how does this work again?